Moroccan security services have recently intercepted a convoy of weapons bound to the southern provinces of Morocco, via the no man’s land labeled Kandahar, between Guergarat and northern Mauritania. The weapons were destined to the separatists settled in the Moroccan Sahara who are controlled by the Polisario front from the Rabouni camp in Tindouf. The arms shipment was intercepted thanks to tips from Moroccan and foreign intelligence services. These services reported the pending arrival in this region of the extreme south of the Kingdom of a group of arms smugglers coming from the uncontrolled Sahel-Sahara zone. Daily Assabah, which reported the news in its Wednesday edition, said the weapons were destined to Polisario militants, instructed to carry out armed actions in the southern provinces of Morocco. To stem all trafficking of weapons and other prohibited items in the border area between Morocco and Mauritania, Moroccan security services launched as of August 14 a large scale combing operation in the area, become a hotbed of smuggling and trafficking of all kinds, the daily recalled, adding that the Moroccan security services work closely with their Mauritanian counterparts to definitely clean up this area. 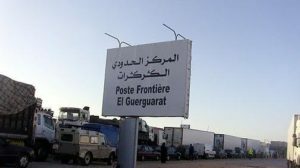 To bar the way to traffickers and smugglers who roam in the region, authorities of the Dakhla wilaya started paving a 3.8 km long stretch of the road connecting the Guergarat border crossing to the Mauritanian territory. According to Assabah, the intelligence services suggest in their reports to equip the military units deployed along the defense wall with electronic surveillance devices and arms detection systems to combat the trafficking of conventional arms or even chemical and biological weapons from the Sahel. Similarly, a report by the British Institute of Studies TechNavio has warned the countries of the region about the risk of terrorist attacks, and called on Morocco, Mauritania and Algeria to take the necessary steps to anticipate any threat. Through the large scale combing operation near the Guergarat border post and Kandahar, Morocco will permanently ban access to the Atlantic Ocean for traffickers and smugglers, including Polisario militiamen, who, under the cover of transhumant Touareg, frequently come to the area to sell weapons purchased in northern Mali and goods of humanitarian aid diverted in the Tindouf camps.